Creamy chickpeas, garlicky light tomato sauce and a pinch of smoky sweet cinnamon make this simple, traditional dish divine. A handful of ingredients, 35 min to prep/cook and you have a hearty, healthy, incredibly flavorful meal on the table. This dish is also perfect to take for lunch as its just as yummy at room temperature. 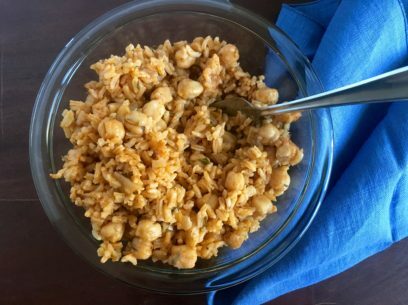 A true one-pot-wonder, chickpeas and rice will become one of your favorite go-to recipes in no time! Feel free to use canned chickpeas here. They work just as well and save you the step of soaking/cooking ahead. Of course, cooking your own chickpeas is always an option too! You also have the option of using vegetable broth or water in this recipe. Vegetable broth is my choice as it adds additional layers of flavor to the finished dish but you can use water also. If you choose to go with water, remember to add another 1/2 tsp of salt to the recipe. Doubling or tripling this recipe is so easy and works well every time. Serve with a wedge of lemon, a sprinkle of dried oregano and a piece of crusty bread for a wonderful week day lunch or dinner. Saute onions for 3 minutes on low heat, add garlic and continue cooking until onion is translucent and garlic soft. Add tomato paste dissolved in water, chopped fresh dill, salt, pepper, cinnamon and rice. Stir well and cook on low for 5 minutes. Add cooked/canned chickpeas, stir and cook on low another 2-3 minutes. Add vegetable broth and bring up to low boil. Lower heat to very low, cover and cook for 20 minutes. Uncover and check that rice is cooked. Stir gently to combine well and serve hot or room temperature. *If you’re using water, add an additional 1/2 tsp of salt. How many people would you say this would serve for a dinner? Around 4? Made this tonight, it turned out great and was super easy! I added some chili powder and a little bit of hot sauce, though it didn’t need it. Thank you for this recipe! do you pre cook the rice or does the rice cook with everything else? Hi Grace, Use uncooked rice, it cooks right up with the rest of the dish! thank you! just making it now excited to see how it tastes! What type of rice do you recommend. In many parts of Greece they favor a semi-polished rice. For USA users, should we use regular long grain rice or Uncle Ben’s? Thank you. basmati. It’s such a great rice for any dish. Long, slender and doesn’t get clumpy or gooey. I love Rovithia me rize……however, I put a little twist to the recipe. Being a diabetic, I’m very careful of sugar spikes….and rice has a tendency to do that to me. So….I substitute cauliflower rice…. (not really rice at all, but a great substitute ….. and wonderful for diabetics for healthy alternatives !!! Love this recipe!! Such a fun way to use cinnamon! OMG = Oh My Greek! What an amazing recipe! I’ve also tried your gigantes plaki – and passed it along to another friend who is now a fan. Thank the Greek Gods for this amazing website!! I may never visit another food blog again. Ever!! Much love to you for compassionate Greek cuisine. I made this for Orthodox lent and it came out great. I substituted one cup of water for a cup of white wine. I also braised the onions and garlic in some water with a teaspoon of vinegar for no oil days. I really want to see a recipe for leeks with lentils. My cousins in Grevena would make them but I haven’t found a recipe yet. Hi! I thought I’d comment that I absolutely love this recipe and have been making it for years since finding your website. I’ve learned not to skimp on the garlic and freshly ground cinnamon!